It happens in the NFL on the first weekend of October. It’s called reality. When the calendar changes and the leaves start to fall, so do the hopes and dreams of hot-starting NFL teams. Why? Because October means every team has played four games. That means every future opponent has four games of tendencies, trends, habits and personalities to dissect and gameplan. I feel like that’s a big reason why the Bills lost in Cincinnati on Sunday. It’s not just me. NFL people I have talked to BEFORE the loss to the Bengals indicated that this was a key game for all of those reasons. The Bills have a new offense under new coordinator Rick Dennison, and a new defense under coordinator Leslie Frazier, inspired by Sean McDermott. Even though those coordinators are veterans in the NFL, their schemes have been adjusted to utilize the new players they have with the Bills. None more important than Tyrod Taylor. Taylor’s early season success was partly a product of what Dennison’s new offense was doing with him. Particularly Taylor’s ability to get out of the pocket and into his comfort zone of throwing on the run. Teams may have been surprised by this, because Dennison’s past offenses did not have a mobile quarterback. So maybe they weren’t ready for what the Bills were doing with Tyrod. 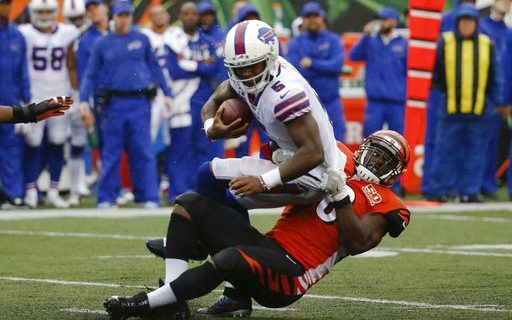 After watching four games, the Bengals seemed ready, rushed Taylor differently, and sacked him six times. Just because opponents now have a better book on the Bills doesn’t mean Buffalo won’t have success moving forward. Every game is different; every week is different. Injuries, matchups, gameplans and team focus all factor into whether a team wins or loses. But now it’s up to the Bills to adjust, knowing what they do well and how opponents will try to take that away. The question is…do they have the talent and ability to adjust? We’ve seen Taylor struggle to be a pocket passer. With a weakened receiving corp, it’s questionable whether there are enough weapons for that to happen. On defense, injuries have hurt the cornerback position. Tre White is still a rookie and prone to being targeted, like Andy Dalton and A.J. Green did Sunday. The NFL is a week-to-week chess match. Even if you know what your opponent wants to do, it doesn’t always mean you can stop it. Good coaches know how to move their chess pieces around. The Bills have good coaches. Give them a chance to respond. I believe they will. But now that the Bills Book has been checked out in 31 other cities, Volumes 6-16 need to be best sellers in Buffalo.